I could not help myself when I saw this sign in a subdivision. I honestly had to look at the sign twice and sure enough, it says drive 18 1/2 mph. That is what you call a very precise speed limit. It is hard to believe next Friday will be July 1st and with that comes hot and humid weather. Find out what to do when your car can't handle the heat. 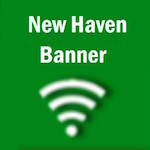 Coach Speckhals, coach for the New Haven volleyball team, held New Haven's annual summer camp this past week. The camp included 2 sessions, an afternoon session for middle school players and an evening session for high school players. The camp began this past Monday and concluded yesterday evening. Among the nearly 400 in attendance on May 10th was the Province Governor, John Martin Israel, Pi Zeta, from the PHI MU ALPHA SINFONIA Fraternity. Did you miss Carl Bounds’s last performance? You are in for a treat today. If you missed Carl Bounds’s last performance or were there and want to relive a moment in New Haven High School history, you are in luck. Today, in a 3 part series you will read about the awards and honors he received and never before seen video of his last performance. New Haven EMS and New Haven Berger Fire responded to a vehicle accident at 10:32 this morning. New claims for unemployment benefits rose more than expected last week; a government report released this morning, suggesting little improvement in the labor market this month after employment stumbled in May. Initial claims for state unemployment benefits climbed 9,000 to a seasonally adjusted 429,000, the Labor Department said. Captain Dan Terry told QNHN late this morning that sometime during the night between the hours of 8 pm and 6 am, a blue Ford Fusion was struck by a vehicle driven by an unknown person.